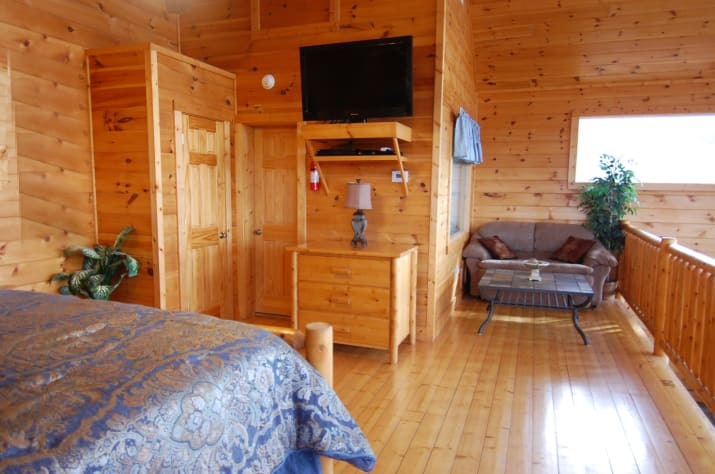 IF PARK VIEW IS NOT AVAILABLE FOR YOUR DATES PLEASE SEE OUR OTHER TWO CABINS ON SMBYO: SECLUDED HIDEAWAY #1437 and SECLUDED POINTE #1435. The minimum age to rent is 25 unless you are a young family on vacation. We have added an Outside Deck entertainment area that is connected to our Entry Door Porch. 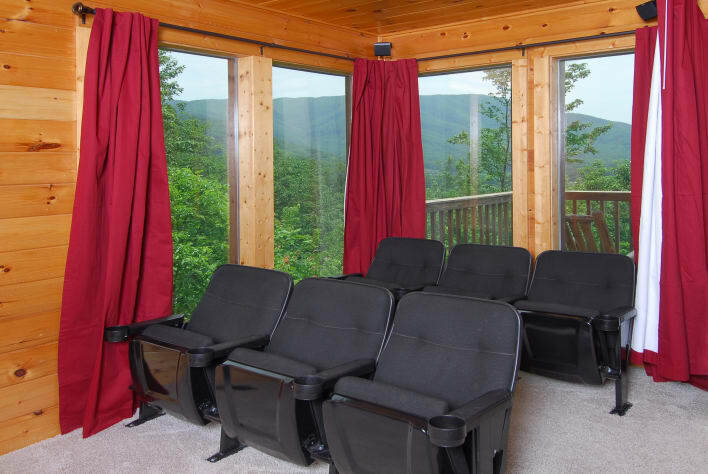 This entertainment area is a 14x12 deck with a beautiful view of our Waterfall and spectacular view overlooking Wears Valley and a 30 mile view of the Smoky Mountains. 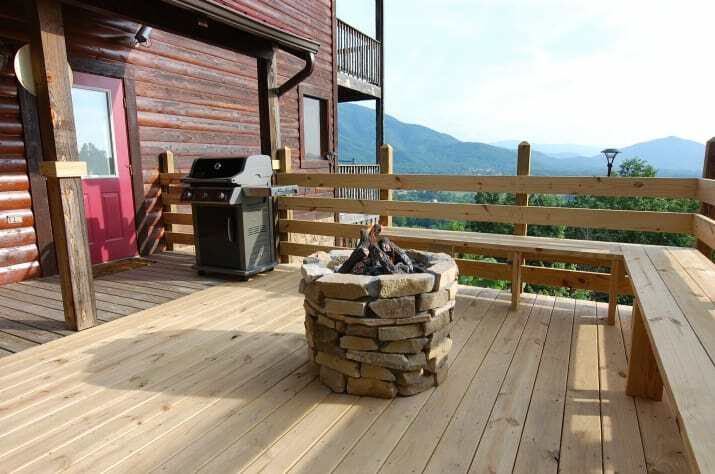 You walk out of the cabin onto a Deck with a Stacked Stone Gas Fire Pit, Weber Gas Grill, Bench Seating, and Outdoor Speakers. 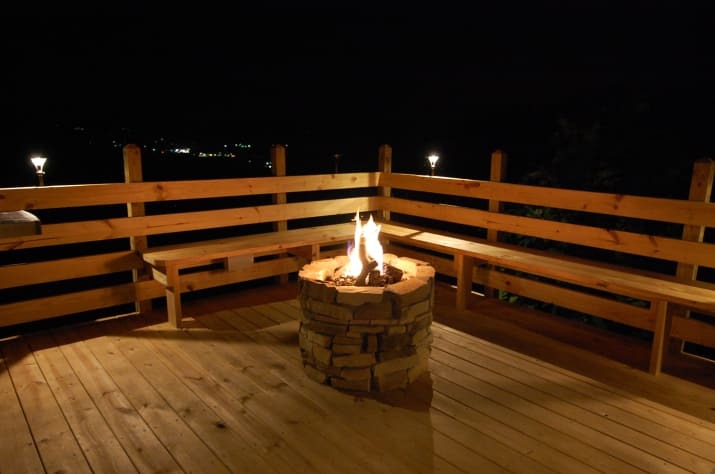 We also have lighting on the deck for your night time enjoyment. 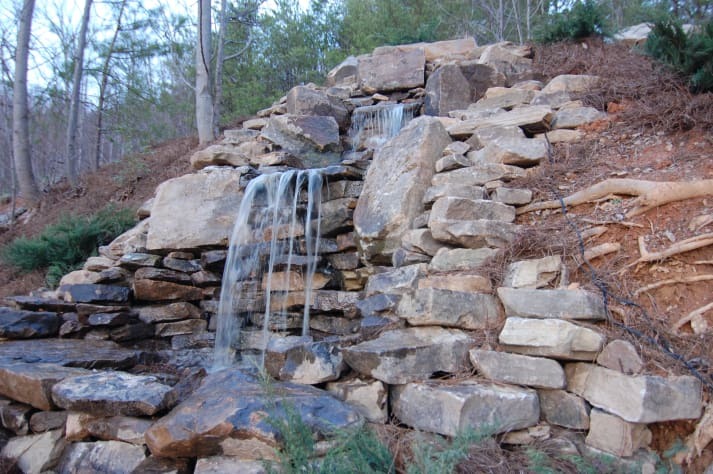 Imagine looking at our Spectacular View, your favorite music playing, a drink in your hand while warming by the Fire Pit, or listening to the sound of the water cascading from our waterfall. 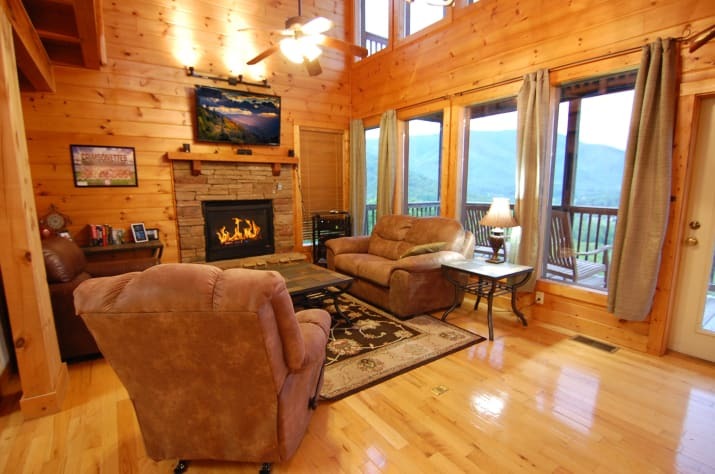 PARK VIEW is a luxurious 3 Story, 3 Bedroom, 3 Bath Cabin located a on a 1 acre lot in Wears Valley. 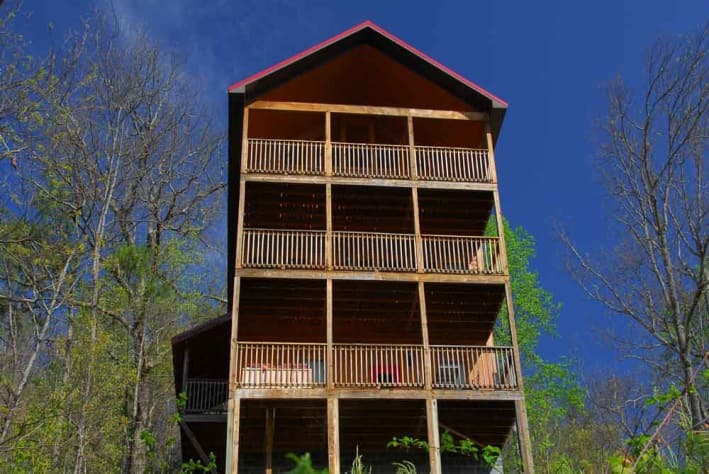 Semi Secluded and nestled in the foothills of the Great Smoky Mountains with a Spectacular View of Beautiful Wears Valley and the Great Smoky Mountains. 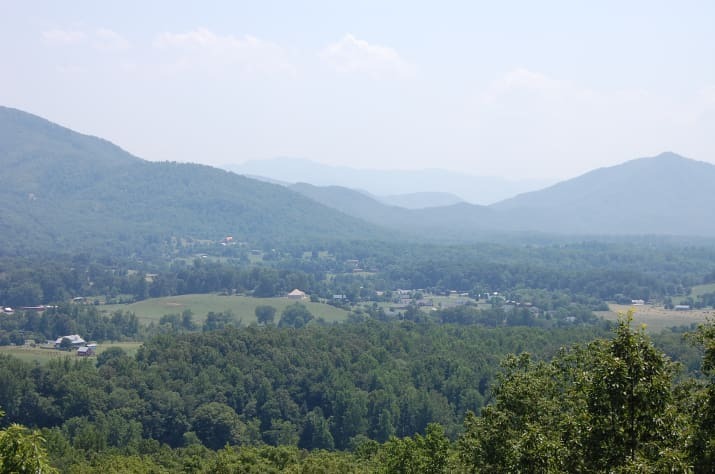 Look across Wears Valley and see into the National Park for 30 Miles. 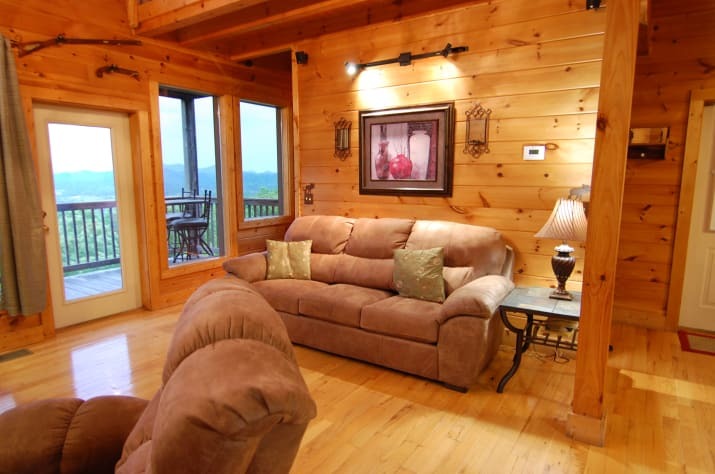 This Cabin is richly decorated and offers a Breathtaking View overlooking the Valley and layered Smoky Mountains for 30 miles! You won't find a better view than ours. 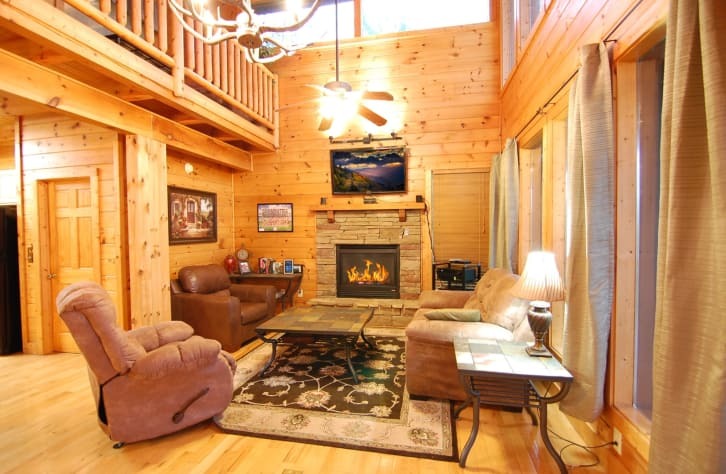 The Den features a Cathedral Ceiling rising to the Loft area, with Large Picture Windows to allow full access to the Spectacular Smoky Mountain Views, an attractive Stacked Stone Gas Fireplace, a Leather Sleeper Sofa with matching Love Seat, Chair, and Rocker provided for your comfort. 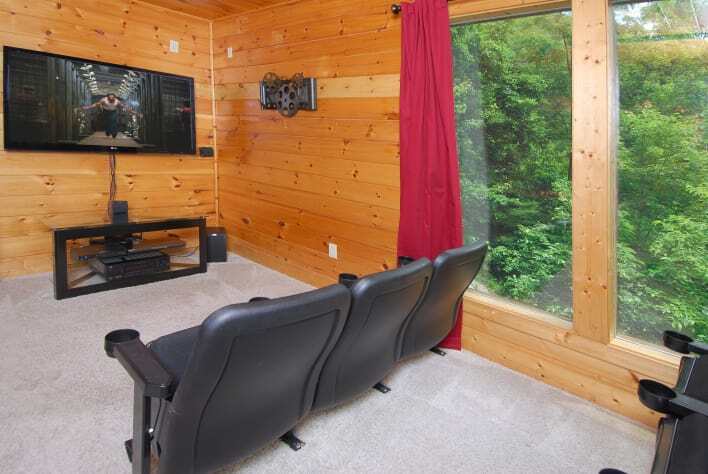 This room has a 50 inch LED TV mounted above the Gas Fireplace and Blu-ray Player. We have DirecTV High Definition programming, NFL Sunday Ticket, ESPN College Extra, and the SEC Channel. You can watch any NFL game with the NFL Sunday Ticket Package on DirecTV. ESPN College Extra gives you 12 different college games to choose from every Saturday during the football season. 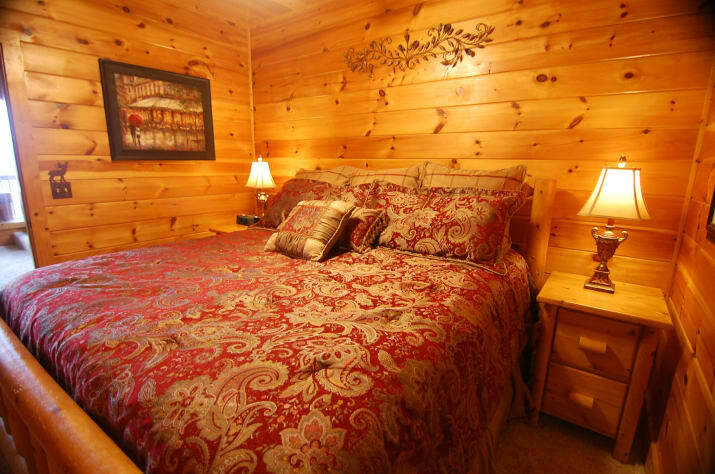 Each of the Bedrooms has a King Size Bed with Plush Pillow Top Mattress, matching Dressers, Nightstands, and Ceiling Fan. 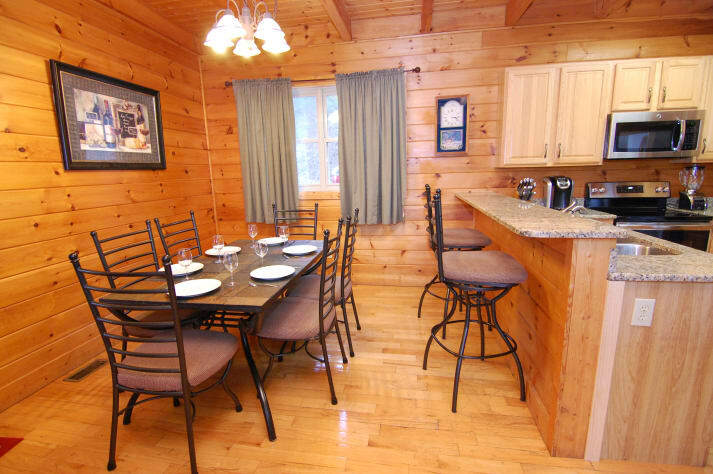 The 2 Bedrooms on the lower level have a 32 inch HDTV. The Bathroom on the lower level has a tub/shower unit. 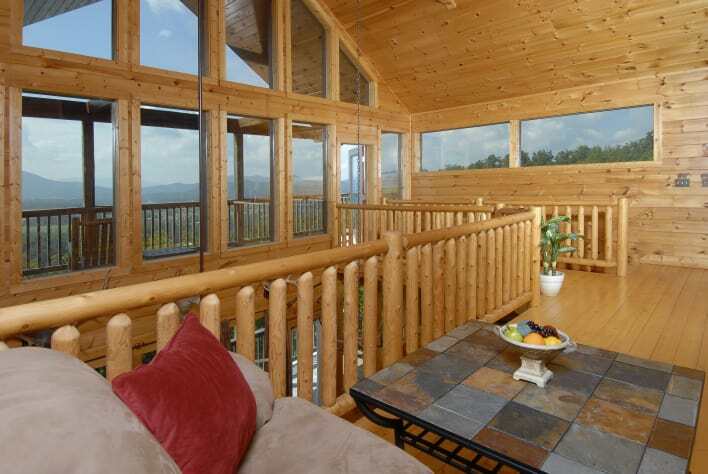 On each of the 3 Levels there is a spacious Deck in which to enjoy the fresh mountain air. 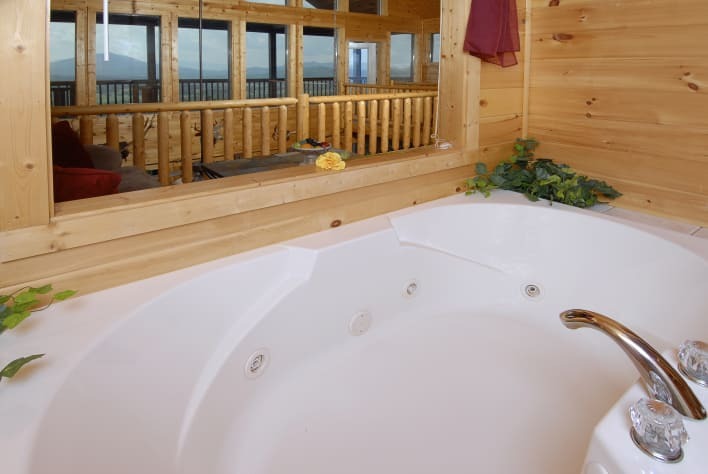 Indulge yourself with a relaxing soak in the 5-6 person Hot Tub with privacy wall, located on the Lower Deck. The Decks on the Main Level and Loft Level have Teak Rockers. 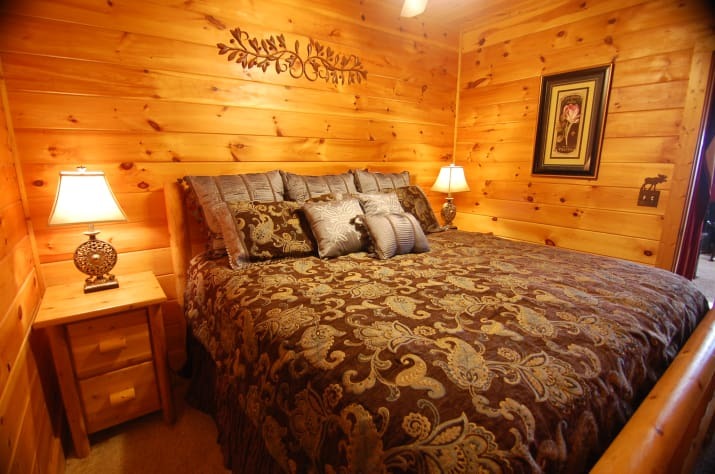 The Master Bedroom upstairs is in a spacious Loft with Cathedral Ceiling overlooking a Panoramic Mountain View. 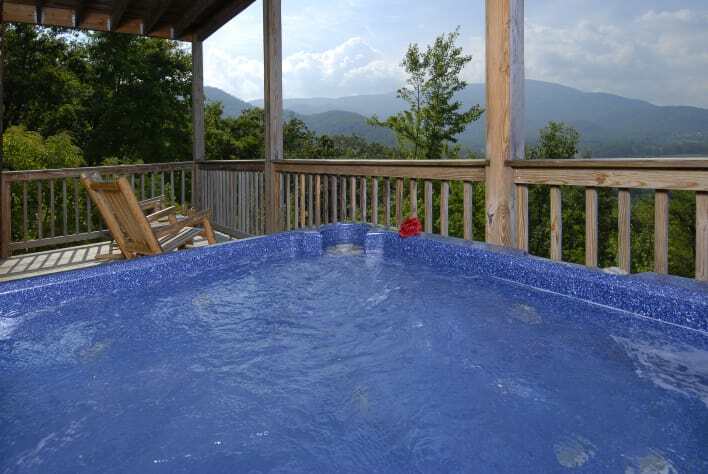 The Bathroom has a 2 person jetted Jacuzzi Tub you can relax in and enjoy the Beautiful View, and a Shower. The Loft Bedroom has a 40 inch HDTV, Blu-ray DVD Player, and Ceiling Fan. 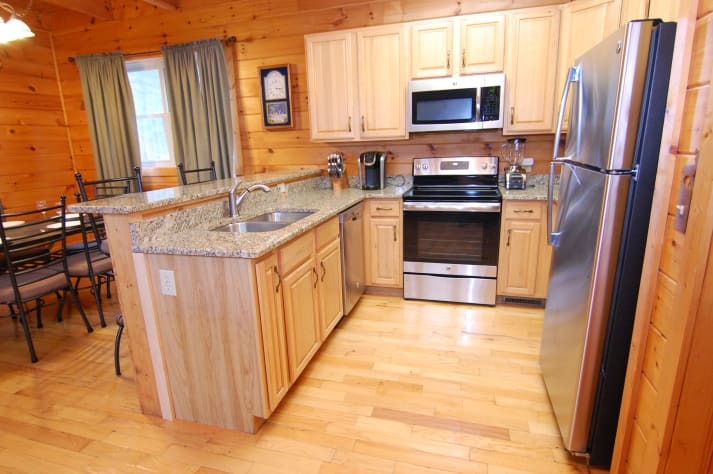 The Main Level features a custom fully equipped Kitchen with granite counter tops, stainless steel appliances and utensils to cook your favorite meal, just bring your food. For your convenience there is a Laundry Closet with a Washer and Dryer. 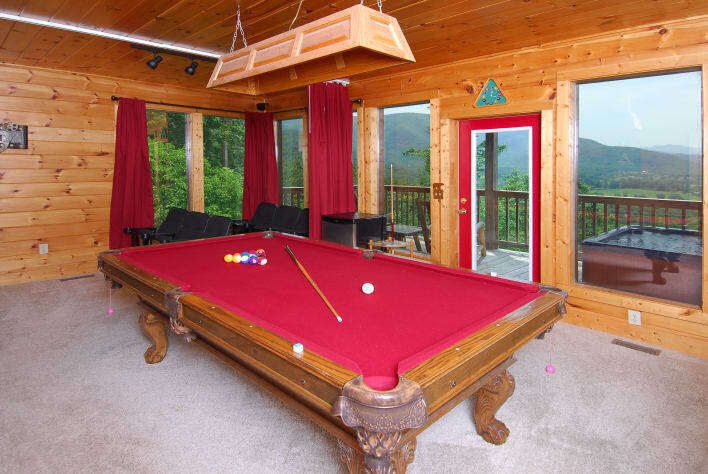 The adjoining Dining Room will comfortably seat 6 guests and offers a perfect view of Wears Valley and the Great Smoky Mountains beyond. 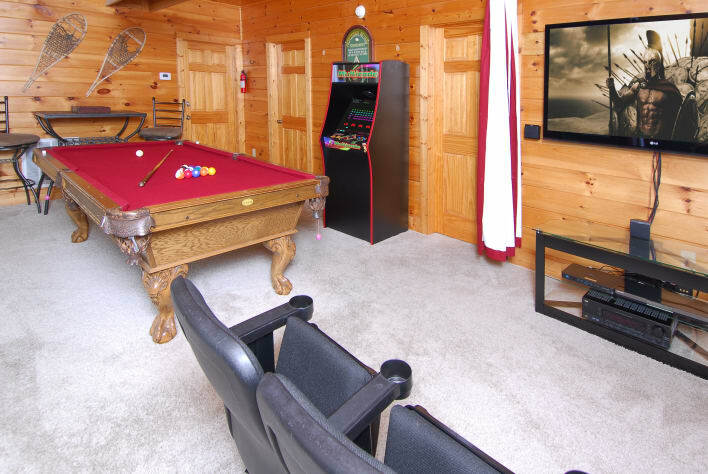 The Lower Level features a large Game Room and Home Theater Room furnished for fun and entertainment. 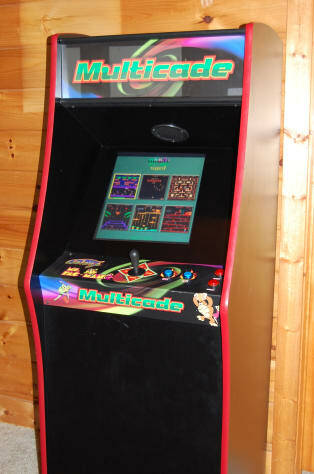 Enjoy a friendly game of pool on our 8' Pool Table or challenge your skills on our Arcade Game with 60 different Video Games. Home Theater Room has 6 Theater Seats, 60'' Plasma TV, Blu-ray DVD Player, DirecTV High Definition Receiver, Free Netflix Movie downloads, and 5.1 Surround Sound System. Sit back and relax while watching a movie on our Blu-ray DVD Player or your favorite team with NFL Sunday Ticket, ESPN College Extra and the SEC Channel on our 60 inch Plasma TV. Choose from hundreds of Netflix movies to download through our Blu-ray DVD Player. 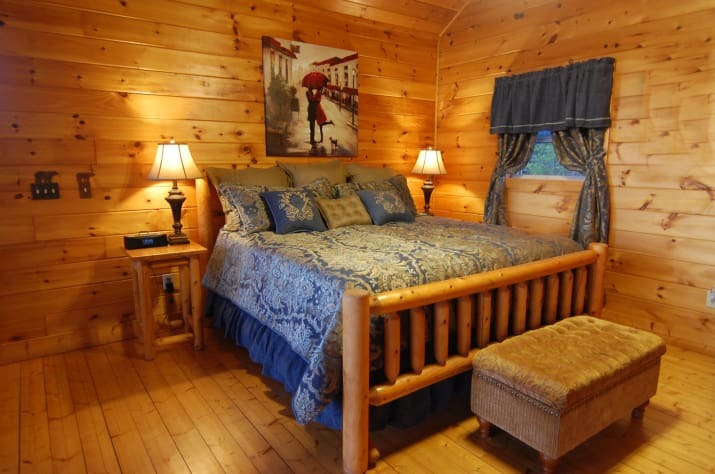 Charming and luxurious, Park View is located in the heart of the Smoky Mountains on a Semi Secluded 1 acre setting. Completely accessible by car. 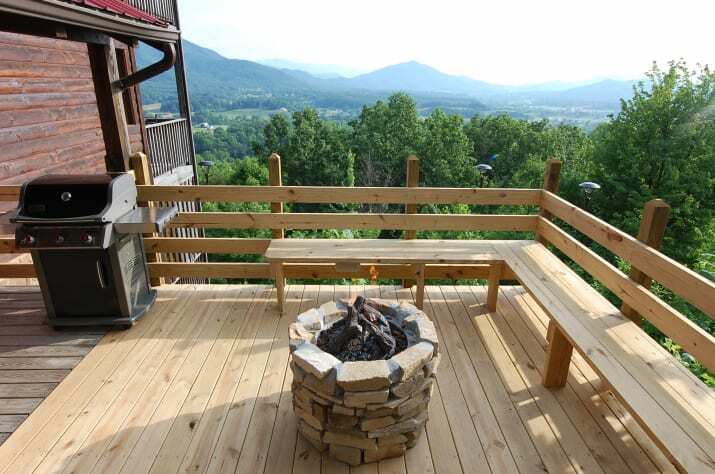 The Spectacular View overlooking Wears Valley and the 30 Mile View of the Smoky Mountains will take your breath away, so come enjoy the Smokies. 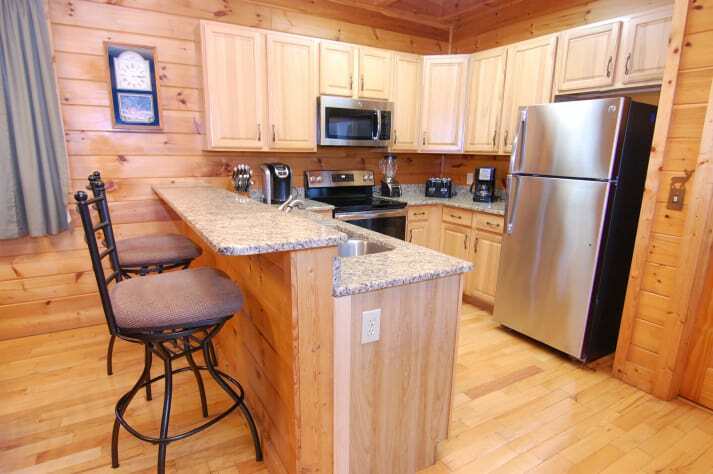 Only a 12-15 minute drive to Pigeon Forge, Sevierville, and Gatlinburg, Smoky Mountain National Park, Dollywood! NO SMOKING and NO PETS, please don't ask.